I've never placed my amp anywhere but the ground and the odd chair. So my recent gigs I've been playing on some small stages and I've been having a hard time hearing my amp. I'm sure the back of my legs have been hearing the amp loud and clear. Most have suggested an amp stand, "Just put it on there and you'll hear it" I'm just wondering what others thoughts are and suggestions on certain types. I was thinking of building a wedge with some plywood and have the amp angle up a bit towards me. I just don't want some big thing I have to lug to a gig. Picture below is my last gig and my set up. I did get some of my guitar through my monitor but it wasn't enough at times. I hate toting them around but invariably try to find a wooden chair at the venue to use. Anything Vibrolux or smaller I prefer a little elevated. a bit. Elevation helps. Closer to your ear, slightly angled, and easier to get to the controls. You lose any bass coupling from the stage floor, tho that may not be a bad thing. Chair works as does a milk crate, but a purpose built stand looks better. A while back, some were building a horn like stands that elevated the amp and used the back wave of the speaker to increase bass response. Only works on open back cabs, tho. Unless I'm using an amp with tilt-back legs, I always use something to get the amp up off the floor. So often I've watched bands where the guitar player thinks his volume is OK but in reality he's blasting away because his ears are about five feet above the speaker. The effect is worse with closed-backed cabs. 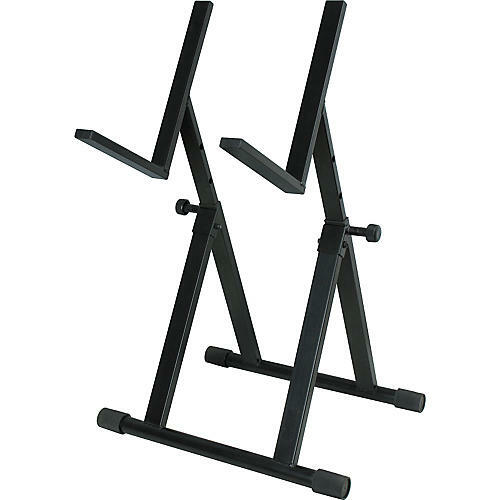 I have an amp stand that I bought at GC a couple of years ago. at the moment, my big Gibson GA-45 RVT is sitting on it. so, it can take the weight. yes, you lose some by putting it up off the floor, but you can hear your guitar better. a wooden chair or a "milk" crate will work just as well. Our singer has a very handsome flight case about 2ft high for two mini vocal monitors, mics and goodness knows how many cables. We found the ideal storage place for this case during a show is under my amp. as I said earlier, I found an amp stand at GC a couple of years ago. the price was reasonable. Something to check out is extruded aluminum frame material and accessories. They are used in various machine automation apps, and come in various sizes. Industrial product distributors handle these components, and pieces are cut to length. With a little thinking, all sorts of configurations can be achieved. 80/20 is one of many name brands. Something to consider, but it will cost more than an old chair or milk crate. In the majority of live situations, especially with hard flooring and reflective surfaces, getting the amp up where you can hear it well and decoupled from the deck will often substantially improve the entire balance of the band. You'll likely set it a little quieter and maybe pull the treble back a bit too. A bottle of beer atop high tension electronics is the first exhibit in the Museum of Silly. That looks pretty cool, and it's cheap to buy. I don't think this would be very hard to make for someone used to wood working. Some good Baltic Birch Plywood would do the trick. It would be heavy and awkward to transport unless you developed a collapsible model. I don't believe there is any "tuning" involved to get the interior volume to a specific amount. Amps (or actually speaker cabs) have better bass when they're on the ground. Don't stand too close to it and do a soundcheck. That's what i thought. And tilt-legs. Meanwhile, his 2x12" Mesa Boogie cabinet is in the backline pointing at the audience. Because he hears the monitor so well, we often have to tell him to turn UP the big cabinet for the audience. He's the only guitarist I can remember having to do that for. i've never used a stand, but always place my amp on a chair, road case, or other object to get it up closer to my ear so i can hear what's really going on. i prefer having the amp perpendicular to the ground, so most amp stands wouldn't work for me because they point the amp upwards at a diagonal. I carried a bunch or peripherals around in a milk crate, so my wife came up with a piece of black material which I simply draped over the (usually bright green) milk crate once it was emptied. Then I stuck my amp on that. Double duty, and the cloth fit in back of the amp, so no extra space required in car trunk! I built myself an amp stand using the legs and hardware off a cheap lap steel. Initially I wanted a stand for my 67 Thomas Vox Cambridge Reverb, which has a 1/4-20 threaded mount on the bottom of the cabinet for the optional chrome stand. I made a pine base for the leg mounts and screwed it to the amp using this thread mount. Turns out Ampegs (at least the 60's Gemini I) also has a 1/4-20 thread mount on the bottom so it works with those, too. I installed a 1/4-20 mount to the bottom of the amp Powdog made for me, and this amp is wide enough for me to put the legs in the back for transport. Too bad the legs aren't chrome, then I could really channel the Vox trolley vibe! I always find that tilting the amp back makes a huge difference, raising it up makes it a little better. If you have an open back amp, make sure the back braces sit in a good place. 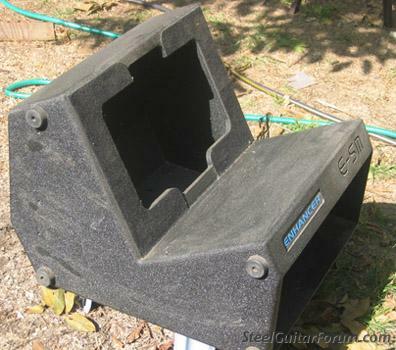 I had an amp stand that was great for a closed back cab, but was worthless for my DRRI. actually, my favorite amp support is a 2x12" cabinet, but i'm between kick cabinets at the moment.